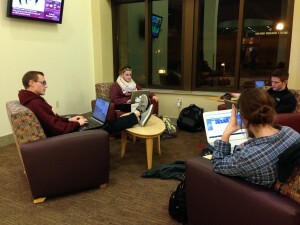 Students can now study past 2 a.m. in Knutson because of 24-hour access to the building. Photo by Liv Ulring. On November 3, Student Government Association announced that Knutson Campus Center will now be open all hours of the day so students have access to printing and areas to study on the north side of campus. After 2 a.m., students may gain entry into Knutson by using their fob at the western doors on the front of the building and behind the building. Despite this change, the Maize, Anderson Commons and Parke Leadership Center will not be open later. Alyssa Coop, president of Student Government Association, said students had asked SGA to lengthen building hours. Coop figured Knutson Center’s location would be most convenient – the Grant Center, which already offers 24-hour service, is on the far East side of campus. “Knutson was obvious because there’s not a building on this side of campus where off-campus students could access for printing or studying at all hours,” Coop said. Teaming up with Student Services Commissioner Josh Mackener, SGA went to Sue Oatey, Vice President and Dean of Student Affairs, to see if they could make this change. After telling her their idea, Oatey had no objection. “If students want to study, this is a great place to do it because it has lots of lounge and study spaces,” Oatey said. Oatey talked with Dining Services and Campus Security to ensure that allowing students to stay in the building at all hours would be possible. Last year, Knutson extended its building hours to be open all day during finals week. Since they had no issues during those times, facility administration had no objections to changing Knutson’s hours permanently. With no extra staff needed, the change will have no cost. Coop did receive questions regarding whether or not Olson Balcony’s hours would be extended in the future. She said SGA is working with Campus Security and Risk Management to see if this could happen in the future. “It’s always a process when it has more risk management measures,” Coop said. For now, students have the abilities to study later on the opposite side of campus.